get weathered out tomorrow, hope to be back out Thursday on. B. Only got a single today, plus 25 aj's and an amberjack head, courtesy of a big tiger shark, some groupers, 3 nice "almost extinct" American Red Snappers, including a non-existent 20 pounder, also a variety of sharks, triggerfish, sea bass. Capt. Chris Kimrey made his day with a few dolphin off of his center console. About 3 weeks ago, Anna brought home Riley. I was consulted about the possibility of the acquisition of a dog from death row in one of the pounds, but I was not informed of his arrival until I got home from the Roanoke. I was also a bit surprised by his appearance. Definitely not what I was expecting…..small, less than 10 pounds…. "so he can fit under the seat in the airplane when we travel.”. He was also very fluffy. Fluffy to the point that the only way to confirm his gender is through careful examination. A casual glance would not reveal his manliness. Riley is also very white, not like white as in a white labrador with always a twinge of yellow on the shoulders or down the spine of the back. No this dog is all white, like white, white. This dog is so white that it might otherwise be named Snowflake, or Cottonpuff. At least it’s not “yippy”, the only thing that he had going for him when we first met. For the first two weeks, Riley and I had some bad “vibes” going back and forth. I had no reason to like him and I probably reminded him of someone bad in his life that he once knew. I would call him, he would go the other way, under the couch, under the table, behind Anna. He wanted nothing to do with me, which could become a problem. Although Riley is Anna’s dog, as much as she travels, I am the one who will inevitably be left in charge of his care and wellbeing. Maybe we weren’t going to be best friends, but we had to come to an understanding that I’m not that bad of a guy and would never hurt the little feller. It started with us sitting down on the kitchen floor next to the open fridge, Riley under the kitchen table, me trying to find the way to his heart through his stomach. A bit of cheese, a sliver of ham, crumb of bread…..these little dogs really don’t need to eat that much. From the open fridge and his tea cup sized dog bowel, we tolerated each other. The closest that he would come to me is when I had ice cream, finishing the last spoonfull or licking the last bite off of the stick of a ice cream bar. This past weekend, it all came together between Riley and myself. Anna went up to DC to visit a friend in town and left me with Riley. First day when I got home from fishing, the little sucker had forgotten totally who I was. He was pissed about being left home alone all day and didn’t want to have anything to do with me. I ended up dragging him out from under the bed and taking him to Dairy Queen. All was fine with Riley’s world after that. It would have been crushed if he only knew what people were saying about him. "Look how cute SHE was” or “What is HER name?” "Oh, where did you get that little fluffball, will he retrieve ducks?" I’m glad that he didn’t’ hear the guy at Jim Dandy asking me what I was doing riding around with a “fluffy, white rat”. Next day, we were going to change all of that. I had to drop the tower boat off at Mobile East Marine to get some overdue not-so-regular maintenance completed. After dropping off the boat, I’ve got a couple of hours to kill, so Riley and I make a drive to New Bern to see Kathy Roberts of Paws-n-Claws. Riley got bathed and shaved, trotting out of the “spa” sporting a blue Mohawk, no confusion of his masculinity now…..but what is Anna going to say about what I have done to HER dog? After dropping Riley off at the house and running a trip in the afternoon, I was hoping things between Riley and I would be a little better, I come in the house, call him and he comes about half way down the hall rolls over and pisses all over himself. Nice. After getting picked up and lightly scooted out the back door, I had a revelation and Riley and I had a conversation. My revelation was that this little guy is accustomed to being picked up, carried, swaddled and doted on by Miss Anna. Rewarded all the time for what? Looking cute? That ain’t going to happen with me. He’s a dog and I’m leader of the pack.....at least til Anna gets home. If he wants my attention, he’ll get it by doing what I say. I have been owned by Labrador retrievers, both blacks and yellows, since my teenage years. Even though, I am a “dog person”, I still have a lot to learn about little dogs, but geeze, they’re still dogs. That afternoon, Riley and I started some scaled down basic obedience training, especially, Sit, Stay, Come. With reassuring lifts of the head and scratches under the chin, he began to “get it” and me and Riley have been just fine. Since Anna’s been home, Riley has latched right on to her, but at least he does come to me when I call him. What do you think? If you don’t give them water, they both will drink out of the toilet bowel, but little dogs have a greater chance of falling in and drowning. Little dogs don’t eat much, a couple grains of Ruby’s left over dogfood and he’s fine. A leftover bag of adult dog food will probably last a little dog’s lifetime. Little dogs and big dogs both like to chase rabbits…..except the rabbits turn around and chase the little dog when it gets close. Little dogs and labs both have gas, just not as much of it. . When walking a little dog, you can ignore the grenade that it leaves in your neighbor’s lawn, not as easy to do with the landmines that labs leave behind. Little dogs don’t mind getting a bath….. When little dogs bite…..it’s cute? AJ’s found me on the grouper grounds today before the breeze picked up. 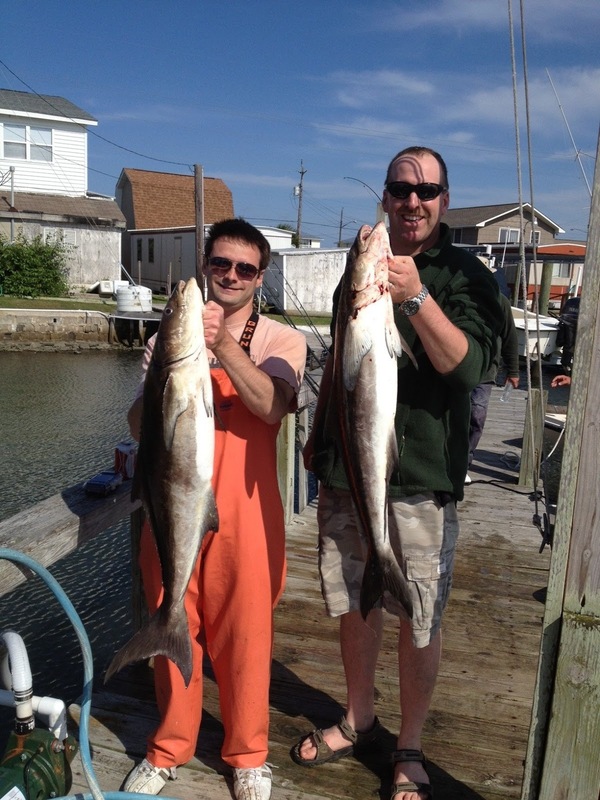 Amberjacks and those 10 pound bluefish. I was dropping a bait down and turned around to check our drift, quick backlash, no problem, going to pick it out, but the live menhaden stalled in the water column. It came tight quick. Zing. Pow. Put that rod up for later. There are a lot of ways to describe these fish, but not many ways to describe how good the dolphin fishing is this year. The big boats like the Bill Collector and the Run Off along with other great crystal coast charter boats are averaging 30-40 big gaffers each day, with many days limiting out.....if you want to keep that many. 10 nice gaffers/person translates into at least 50 pounds of meat/person. Mixed in with the dolphin are a few wahoo.....my favorite sushi....next to a fresh yellowfin.....also some blue marlin in the mix. Above is a pic from Capt. Justin Haddock who got into the action on his center console, Capt. Greg Voliva even got a good lick on them this morning before the wind picked up. Some pics to follow from some of my outings, today it was aj's and over-sized bluefish until the wind got up, then anchored up and got lucky on a double header of keeper cobia. How did the fishing go today James? "One nice blue marlin that stuck his bill through the hull and two sailfish today." "Yes sr it went all the way trough, the good part it is that it was above the water line. we still got about 6 inch of marlin bill stick inside the hull." Good bait fishing on the bottom today, Capt. Joe Shute caught 3 keepers, Greg caught a couple as did Charlie Brown, we beat our way out to the grouper grounds and got our limit of 10 pound + gags, plenty of bass releases, sharks, couple of dolphin. Good fishing. Hey, the guys have got some openings this weekend if you want to get out. 3/4 day for $600. May be able to put together something for some singles if we can get 3 together. I'm booked, but I'm sure that Greg and Chris would like to go fishing..... looks like Joe Ward and Gary have some openings up the river and in the sound. Greg fished out of Oriental yesterday and did really good with the trout, including some very nice grey trout. "Why can't you catch fish like him?" Neither of us are getting what we want and fishing is really tough......but I think that's going to change after this little blow and we get this tropical storm up the road. On Alberto's heels there will be a lot of life coming ashore. 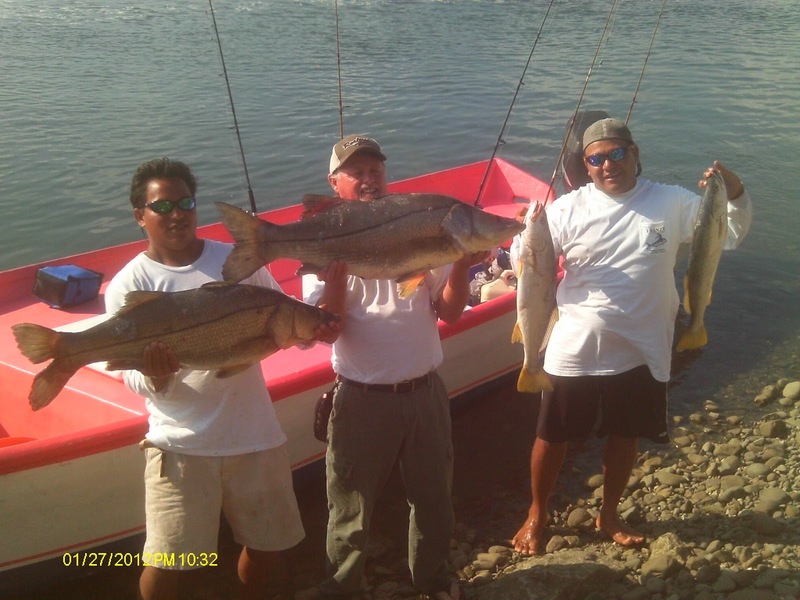 With low chances of thunderstorms and relatively calm seas, there is some great fishing out there.....problem is, there haven't been many days that we've been able to get out there on the little boats. Offshore boats are crushing the big gaffer dolphin, some wahoo and daily shots at billfish. Greg caught a white marlin the other day off of his center console. This good fishing is going to continue through June. With a livewell full of fresh bait and relocate in the right spot and you never know what you're going to catch, everything from dolphin, grouper, baracuda, amberjacks, mackeral, both kings and spanish, sharks of all avarieties, big jumbo sea bass (season on them opens June 1), red snapper(season closed) and even consistent shots at cobia that come up and check out the boat. .....yeah, it rained, it blew, but we made a good day of it. Got to tell a quick one on myself......if anyone in the boats around us has video, it would be worth a lot.....but I'm sure that my offers wouldn't be enough. We spent a lot of time catching bait this morning, had about 4 dozen big croakers. Looked around under terrible conditions, set up in a couple of "new" spots, bent the heck out of an anchor.....can you fix that one for me Capt. Ray? So I went to my standby spot in the inlet, there were 5 other boats there, within a couple hundred yards, enough for me to have a kiniption and fall into the floor of the boat like a freshly gaffed cobia if I were fishing around that many people on the Pamlico, but things are a little different here. My expectations are not high, but we're going to give it a shot and make this half day with probably a big sting ray or a shark. I get my 3rd line out and the first one bounces and starts to bow over. I get it, set the hook and a nice 40 pound cobia skies out of the water. This is getting everyone's attention around us, I haven't been there 5 minutes and we got 'em on. Bring him around so that everyone can see us gaff it and put her in the box. Cool. Already exceeded my own expectations. Let's get 'em back out, maybe we'll get lucky and get another bite before heading in. 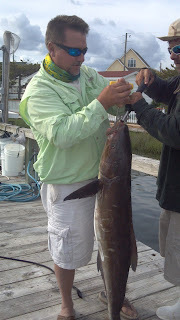 Just get the last line out and the stern line goes off, comes to the top and wow, it's a big cobia. Now everyone is watching us.....10 minutes, anchored up in the middle of these boats that have been fishing for God knows how long and we're hooked up for the second time.....but wait, this one has got another cobia with it. Get the bucktail. Refusal. Cast the croaker at him......heck he's right there, let's stick the big one and worry about the little one later. Gotcha. Nope. The first time I stuck this pig, I got him right on top of the head, lifting halfway in the boat, she jumps off the gaff, no problem, she's still attached to the line. Second time with the gaff, she comes in the boat. nice 50 pounder, hook out, settled down, oh, and got 'em on, we're hooked up with the little guy, maybe a keeper. Let's put this big boy out of the way and in the box.........big mistake. With the lack luster fishing, I haven't been bringing the big cooler and have been putting them in the fish box on the transom. No problems....until today. Keep in mind that EVERYONE now has all eyes on us. Third fish hooked up and second one going in the box. I've got it balled up, head in one hand and tail curved around in a horseshoe and plenty of adrenaline, I can hold her. Hatch open and heading to the dark, when all that coiled up tension came unglued, she went in the box, then opened the hatch on the other side and out she launches, briefly landing on the transom, with me diving over the gunnell, fish in the water and me right behind her, inches from getting a grip on her tail.......GONE. The only thing that kept me from going in behind her was the lip of my white boots caught on the open fish box door. Land the 3rd one, short. Get everything back out, disgusted and within 10 minutes we've got a very small amount of redemption on the line again with #4. A keeper, but no bruiser. ....rumors of baitballs and cobia on the two days that I didn't fish......I think someone is really starting to mess with me....at least the cobia are messing with me. I did get a little one today, but made the day with groupers and aj's.....not too bad if you like that kind of stuff. Capt. Chris did the same, but Capts. Greg and Joe played close and bait fished on the bottom. Joe got his and Greg plucked a pair not far from him. 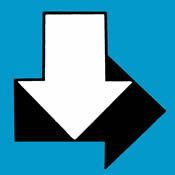 In the meantime, enjoy the above. Sure, long sleeves for sun protection, but the layers is because it's been cold out there. I'm looking some warmer temps, both up in the tower and in the water. .....almost a citation. It pains me to hear what Rick Caton did this same day up the beach. He is the man when it comes to sight casting cobia and from whom I learned a lot of tricks that I keep in my bag. Over the past few years it may have been Rick whining, but this year I'm doing the crying. You can believe that if at all possible, he's going to get his and I'm going to try to get mine.......but I sure would like to get a few more shots......back at it tomorrow. .....to let them grow up. Just got a report from Capt. 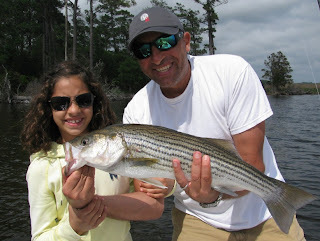 Rod up on the Roanoke, he had 185 stripers yesterday morning and no one else was on the river. Rod has openings for a half day on Thursday, Friday, Saturday and Monday. With the sorry cobia fishing along the beach, several of us charged offshore to take advantage of the great dolphin fishing, Capt. 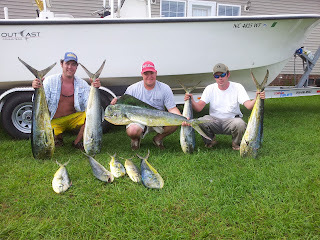 Chris Kimrey had a great day with the dolphin and bottom fishing and Capt. Greg Voliva busted the dolphin and a nice surprise of a white marlin release. I stayed a little closer with two half days and made both trips with nice gags, triggers and PLENTY of action on the jumbo sea bass......too bad that the season doesn't open until June 1. 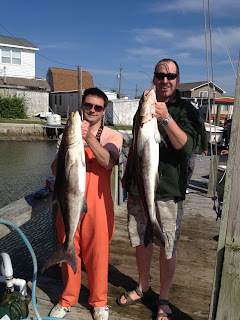 We did prevent a 41 pound cobia from making it any further up the coast, but that's the only one that we saw. I saw no signs of life along the beach, a little disappointing after seeing a few fish the last couple of days. I did see them stacked up on the dock along the MHC waterfront. BIG gaffer dolphin, blackfins and wahoo.....also a blue marlin on the Bill Collector today and a big blue one on the Run Off yesterday. 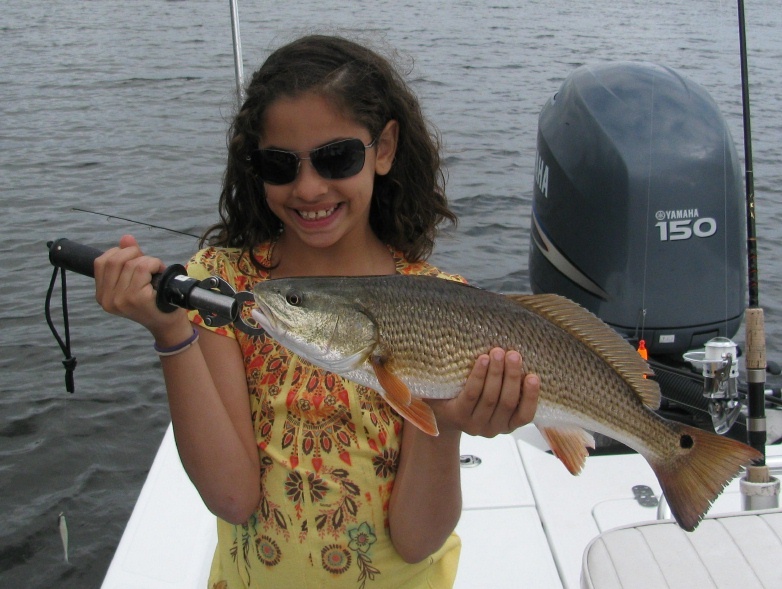 The weather this weekend is supposed to be excellent for offshore fishing and the Run Off is open. Get a group together and give us a ring. Great reports again coming from up on the Roanoke, Capt. Rod Thomas had a 300 fish day today with at least a dozen over 30 inches.....now that's getting them.....maybe I came home too soon? Capt. Joe Ward and Greg Voliva reported over 250 striped bass releases between their two boats this morning. These are some pics from Capt. Gary Dubiel on a recent Neuse River trip. He's getting what he needs as you can see from the big smiles. Yes, I got mine yesterday, not a whopper, but we finally put some meat in the box. Caught 2 little ones on a buoy, then went on the big ride in search of cobia, then in search of bait. Found the bait and one more little cobe. Then we went the right direction. Saw a pair that wouldn't eat, our keeper and a monster that I saw a little too late. A lot more life out there yesterday than earlier in the week. It's going to be a zoo this weekend with the pretty forecast. Expect to see me on the horizon with a bent rod. The Roanoke seems to have fizzled out. A decent late afternoon or early morning bite, but other than the last reported great days, the motherload never arrived. I made my first cobia trip today, we road 70+ miles and saw one dink, put some bait on the bottom at the inlet and hooked a good 'un, only to get it cut off by another boat......yet another reason I would rather sight cast by myself than anchor up in a crowd. Actually, we were pretty much by ourselves, but when we were identified as a hooked up boat, one of the observing boats decided to give it a try and dropped their anchor between us and the fish as we were casting off the anchor ball. Busted that one off. Up the beach there was a really good bite. easily a 100 fish morning/boat, all artificials, top water and the fly. Really amazing fishing since the water jumped up the thermometer and all those fish scattered downriver jumped up the river to Weldon. Strong spawning/topwater action last night and early this morning with a good jig and fly bite until about 11 am. By far the best of it was between 6 and 8, but we were still getting doubles on our last drift. If this is what you were waiting for, you better get here now.